J.G. (USA) 1) I thank God that my mother, RUTH, had a peaceful passing home to God through the intercession of Our Blessed Mother & Bl. Pier Giorgio, to whose care I entrusted her years ago. Mom was almost 100 when she died this past January. 2) I am personally thankful for many personal favors and spiritual support that I have received personally over the years. 3) My special need during this novena is that my move to a Catholic retirement community will go smoothly and that I will be calm during the process. Moving-Day is June 27, the Feast of Our Mother of Perpetual Help, to whom I have had a life-long devotion since childhood. Also I pray for good health and many blessed years ahead. 4) For ALL those throughout the world who are taking part in this novena, that God's Divine Mercy will be poured out on us in abundance. Also, the Bl. Pier Giorgio will be canonized SOON!! C.D. (Torino) Caro Pier Giorgio, aiuta me e la mia famiglia a superare questo difficile momento in cui sembra che ognuno vada per conto suo e non riusciamo più a capirci….aiutaci a rimanere uniti e a trascorrere il tempo serenamente….tienici uniti a Te, a Gesù Eucarestia e alla Madonna. Aiutaci a dire insieme il Santo Rosario, Tua preghiera prediletta. A.L. For the healing of Shawn Lunde. M.T. (Torino) Per Davide, perché il suo cuore sia guarito e liberato dal male e dai disordini che lo separano da Dio. Perché incontri Gesù, si senta amato ed impari ad amare. Per la purezza del suo cuore. L.B. (Italia) Vorrei che nella novena al Beato Piergiorgio si pregasse per la guarigione di Colette, affetta da un tumore gravissimo e rarissimo. M.T. (Olympia) Here are some intentions. Bless you for your ministry. 1. For the identification and formation of catechists. 2. For conversion of my husband. 3. For conversion of my children. M.M. (USA) That the Lord would see fit to cure my husband, from Multiple Myeloma. P.D. (Catanzaro) Anche quest'anno mi associo a voi nel recitare la novena dedicata al nostro amico Piergiorgio al quale chiedo di intercedere con il buon Dio affinché mia figlia Roberta, dopo due lauree e anni di precariato, possa finalmente avere il suo lavoro a tempo indeterminato. Ad ottobre si sposa e questo lavoro le serve immancabilmente. Grazie a tutti voi per le vostre preghiere. Grazie per la opportunità unica di essere insieme da voi! Sempre in sintonia! Verso l’alto! G.H. (USA) Please pray for my sister,Peggy Ballew,who has stage four lung cancer. She has been praying to Blessed Frassati for a miracle. We are hoping to help him become a saint. Thank you. Blessed be God for you all. S.M. (USA) Please pray for the discernment of my vocation, and the consideration to begin a relationship with someone close to me. I’m hoping and praying that I will be guided by the Spirit and through the intercession of Bl. Pier Giorgio Frassati to make the right decisions. Thanks and God bless! M.M. (USA) I would Like to pray for purity and true love into relationship for Patrik and Maria. And touch of Gods love for Patrick to heal his heart from ilness. Our dear Pier Giorgio pray for us. Thank you. M.C.C. (USA) Please pray that Colleen will return to her family. Thank you! M.A. (SOLT) Thank you God for answering my prayer. For my son Marcos. God you now my heart and my intentions for my son please hear my prayer.Amen. R.G. (Italia) che Pier Giorgio ottenga la grazia della guarigione ad Hassan. Dopo un intervento a cuore aperto, Hassan ha avuto un'ischemia ed ha perso l'uso della mano destra. Preghiamo perché possa tornare ad usare la mano. Grazie. Cheryl Please pray for me, for I am always so very lonely and sad because I have no one to talk to and hang out with. Pray I may know my vocation or what to do with my life. Pray I can find and obtain a good-paying, respectable with benefits like insurance and Social Security. Pray for the conversion of Jack G. Patterson from atheism to the Catholic Church; pray that he will return to me as my close friend, or pray I make new close friends. 1. Por las familias afectadas por el.volcán de fuego. 2. Por el gobierno para que trabaje honradamente y responsable por el bien de mi país. 3. Por la salud de mi mamá de mi hija y la mía. 4. Por que yo pueda encontrar un trabajo estable y que me permita cubrir las necesidades de mi casa. Innanzitutto desidero ringraziarti per la tua vicinanza in uno dei momenti piú difficili della mia vita. Ho potuto sperimentare la vicinanza di un amico sincero. Perchè è cosí che ti sento, un amico. Attraverso questa Novena ti chiedo di aiutarmi a perseverare nella preghiera, nella caritá e nello studio che troppo spesso accantono per pigrizia ed egoismo: che io posso imparare dalla tua costanza e dedizione. Ti chiedo di rendermi capace di farmi prossimo dei miei fratelli piú piccoli, piú poveri ed ammalati. Ti chiedo di aiutarmi ad amare, rispettare e proteggere la mia famiglia, come facevi tu. Ti chiedo di intercedere presso Dio Padre e presso la Nostra Madre Celeste affinchè la mia fidanzata possa aprire sempre piú il proprio cuore alla fede; cosí da poter costruire la nostra famiglia ad immagine della famiglia di Nazareth. Ti chiedo di illuminare la mente ed il cuore dei nostri governanti, affinchè possano realizzare quello che era anche il tuo desiderio, cioè di "inserire Cristo in ogni angolo della societá". Ed allo stesso tempo che anche noi cittadini possiamo avere il tuo coraggio di partecipare alla cosa pubblica con coraggio ed intelletto. Ti chiederei tante altre cose, amico mio, molte delle quali non saprei come esprimere ma so che non sarai mai estraneo ai miei bisogni. T.W. (USA) That God's Voice will resound in the hearts, ears, eyes of the young people of our parish to courageously respond to service for the spiritual well being of the People of God by courageously giving up their wants to satisfy the need of others in follow Christ in religious life. E.M.M. (USA) Please pray for the healing of Maria and Joseph (aka Nadida and Nikolai) Lapardi. K.T. (USA) Please pray for Fr. Jim Lee in Olympia, WA. He has been our parish priest and shepherd for 20 years. He is diagnosed with ALS. He has asked us to pray for a miracle though the intercession of Bl. Frassati. I hope this intention can be included in the novena intentions. For his healing from ALS and for strength of mind, body and spirit. K.S. (Olympia) Please pray for Father Jim Lee to be cured from ALS. Our Parrish loves him so much! If you would like us to pray for someone, please email us back. M.M. (Olympia) My prayer intentions for Frassati novena are for our beloved pastor at St. Michael Parish in Olympia, WA, USA, Fr. Jim Lee. He has been diagnosed with ALS and we (his parish family) have been praying for Bl. 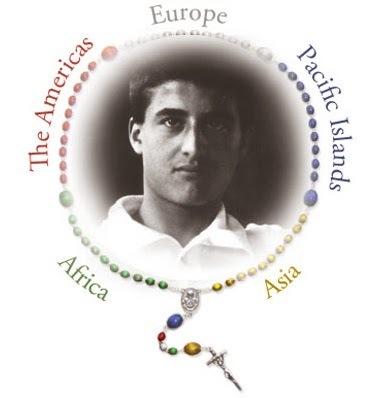 Pier Giorgio Frassati’s intercession since January, 2018 when Fr. Jim told us of his diagnosis 🙏🏻🙏🏻🙏🏻! T.O. (USA) Please pray for Ethan, chad, Frank, Clay, Frank, Lillian, helen, Earl, sue, Jim, Paul, Father Jim. Teresa, all immigrants seeking asylum due to political dangers, Maggie. Ken, nettie, mothers brother and sisters, the departed and persons waiting in pergutory, my wisdom group. The following are the novena intentions I am asking of Blessed Pier Giorgio. I beg him to cure my brother Christopher Monreal, also a victim of polio, who is very ill with pneumonia, sepsis and mental illness. I also ask him to cure my sister Mary Grace Monreal of her mental illness. In addition, I ask him to cure my husband Mark Voissem of the infection in his right leg. These things I ask trusting in God's will and Blessed Pier Giorgio's compassion. A.C. (USA) "For my Uncle Chris"
"For my Family & Friends to be drawn to the Church"
"For my friends to achieve their vocations"
T.M. (USA) Please pray that my memory problems will go away. I also pray that financial stability can come to my company Spirit Cares and to my family. C.G. (USA) Return to faith for all my children and spouses, and my husband. Healed marriage for M & E. Financial security for the same children to ease their burdens and stress. B.B. (USA) For Divine Wisdom, Understanding, Guidance and intercession to know and implement the special calling which is mine alone given to me by our Almighty Father at the time of my creation. In Jesus name, my Lord and Savior, I ask this intention. L.L. (USA) Please pray for the intentions of Fr Jim Lee in Olympia, WA, USA. I also ask, God willing, that Fr Jim may be healed and recover fully from ALS disease, and strength to endure his suffering. God bless you. Anonimo Per mia sorella che,nonostante una operazione importante,non sta ancora bene.mi è rimasta solo lei della famiglia.vorrei che stesse bene.è un periodo che va tutto male e non riesco a sentire il Signore vicino. Parrocchia di Pollone (Italia) La parrocchia di Pollone come tutti gli anni partecipa alla novena, celebrando l'Eucarestia e pregando con i bambini, i ragazzi, i giovani e gli adulti presenti alle attività estive. Chiede un'intenzione particolare per i giovani della parrocchia. D.G. (USA) I just want to ask my dear friend Blessed Pier Giorgio Frassati to help me sought out my life for whats best.Many thanks Pier Giorgio. M.G. (USA) That if it be in accordance with the will of God, that we conceive another child. offro questa Novena in tuo onore affinché io riesca finalmente a sistemarmi definitivamente nella nuova abitazione e possa così trovare la pace che purtroppo mi è sempre mancata nelle situazioni abitative del passato. Continuo a chiederti benedizioni per le vite di mia sorella minore Eliana e del piccolo Youssef di cui sono tutrice. M.H. (USA) Please pray for discernment in my upcoming career decision, that I will know without a doubt where I'm supposed to be and what my purpose is. Please also pray for healing of my eyes, head, and neck and relief from depression and anxiety. E.B. (Italia) Please pray for discernment in my upcoming career decision, that I will know without a doubt where I'm supposed to be and what my purpose is. Please also pray for healing of my eyes, head, and neck and relief from depression and anxiety. M.F. (USA) Prayers for our dear Father Jim Lee who is suffering from devastating disease that is ALS. Prayers for his complete healing. M.T. (USA) I, together with my parish, seek intercession on behalf of our pastor, Fr. Jim Lee, who has a tremendous devotion to Per Frassati and is living with ALS. We pray for healing, courage, strength, and peace. K.C. (USA) Please pray for complete healing of stage 4 metastatic cancer in a young mother of 4. Her name is Celine Carlson Larson. In addition please pray for Todd Dennison to be healed from bone cancer. S.S. (USA) Thank you for this beautiful novena that we are beginning today! S.P. (USA) Please include the following intentions in your Novena starting today. I'll be praying it with my friends too. C.F. (USA) Hello, I am joining the novena and would like to add a couple intentions. - my healing- cancer treatments and knee surgery. - my sister and boyfriends conversion. The prayer intention request is for Father Jim Lee (St. Mike Parish, Olympia, WA USA) that he is cured of ALS disease. T.M. (USA) For the complete healing and recovery of Lexi Thomas, who is suffering from cancer. L.C. (Italia) Per la guarigione di Mucci. T.M. (USA) Please pray for the healing of our beloved parish priest Fr Jim Lee from his diagnosis of ALS. May he have the strength to continue with his important vocation as a priest in the service of God. I ask thru the intercession of Blessed Pier Frassati, friend of the friendless that God will send me and my cousin Joshua more kind-hearted God-fearing friends in our live esp that I may have the grace to be married to a good catholic husband ASAP. M.S. (USA) That I may find the girl meant for me. Thank you so much! Verso l'alto! Healing miracle for Father Jim Lee of St. Michael's Parish in Olympia Wa. Healing for Jones family struggling with family differences and isolation from one another. Healing for Mother feeling rejected by Son. Holy Spirit and Blessed Frassati to open the hearts of family members for one another. Miraculous healing of ALS for Father Jim Lee, Pastor of St. Michael's parish in Olympia WA. Holy Spirit and Blessed Frassati intercession for healing of family wounds. Healing for hearts hardened toward one another of family members. Healing for feelings of rejection by Son toward Parents. M.R. (USA) Please join me in praying to Bl. Pier Giorgio Frassati for the intentions of Fr. Jim Lee, pastor of St. Michael Parish in Olympia, Washington, USA.